Do you have Mildew or Algae staining that needs cleaning in Delaware, Pennsylvania or New Jersey? Call Vesta Wash Now! We have a proprietary method of killing the algae, washing, and treating your stained and infested home / business. If you don’t see it call us! 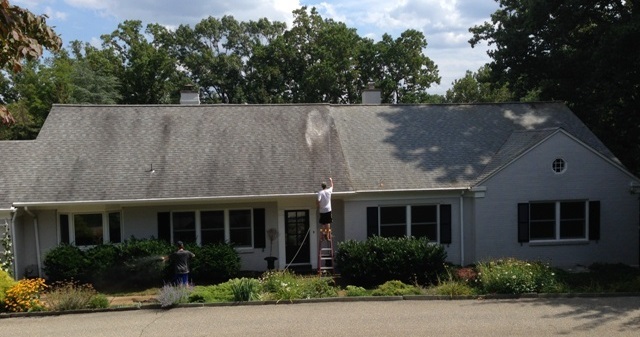 Vesta Wash is a professional company that cleans roofs, siding, stucco, cedar, decks, slate, tile on residential and commercial properties without using a pressure washer. We have achieved 5-Star status with SoftWash SystemsTM and are an active member of the SoftWash SystemsTM network of exterior cleaners across the country using the latest cleaning methods and techniques – one of which is softwashing. You are not just working with a company that operates in the greater Philadelphia market. SoftWash SystemsTM has approximately 100 applicators across the country that use their proven cleaning system. AC Lockyer has pioneered the method of cleaning without using a pressure washer and over the last 25 years over 100,000 properties have been cleaned with this method. AC has a background in horticulture, and has developed methods to protect your plants. SoftWash Systems methods have been used to clean single family homes, townhomes, complexes, midrise commercial properties, apartment complexes, universities, hospitals and projects with varying degrees of complexity. Vesta Wash has access to AC Lockyer and his expertise for any cleaning project. No other company has this type of national support. If you have a property in the Poconos, the Jersey Shore or Eastern Shore or anywhere, we can refer you to a professional company.